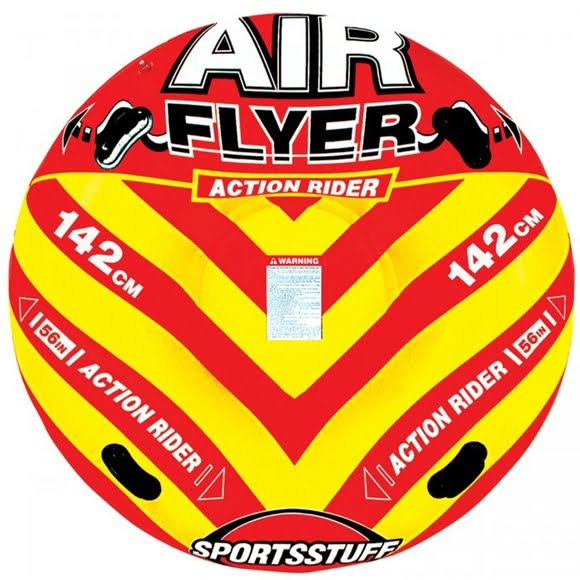 The Sportsstuff Air Flyer is a king-sized, classic round snow tube with room for two. With over-sized molded PVC handles, single-chamber inflation and a convenient patented speed safety valve for fast inflation and deflation, the Air Flyer inflatable snow tube gets down to business when it comes to the technology of getting you down your favorite snow-covered hill. The Sportsstuff Air Flyer is a king-sized, classic round snow tube with room for two. With over-sized molded PVC handles, single-chamber inflation and a convenient patented speed safety valve for fast inflation and deflation, the Air Flyer inflatable snow tube gets down to business when it comes to the technology of getting you down your favorite snow-covered hill. Take a ride on the Air Flyer snow tube for two and make the most of your snow days this winter.